This book is the second volume in the series Armed Conflict and the New Law, the first being sub-titled 'Aspects of the 1977 Geneva Protocols and the 1981 Weapons Convention' and published by the British Institute of International and Comparative Law in 1989. Like its predecessor, the contents were for the most part first given as papers to the Discussion Group on the Law of Armed Conflict which the Institute has been organising since 1985. The theme of the first volume, as indeed was the initial purpose of the Discussion Group, was an examination of the new law introduced into the Laws of War by the Additional Protocols of 1977 and the UN Weapons Convention. The theme of the second volume is different and derives from a view frequently put forward by speakers in the Group, and well expressed by Dr Hans-Peter Gasser: '...the issue is not so much to set new standards as to improve the record of compliance with existing substantive norms of international humanitarian law'. "Armed Conflict and the New Law Vol. 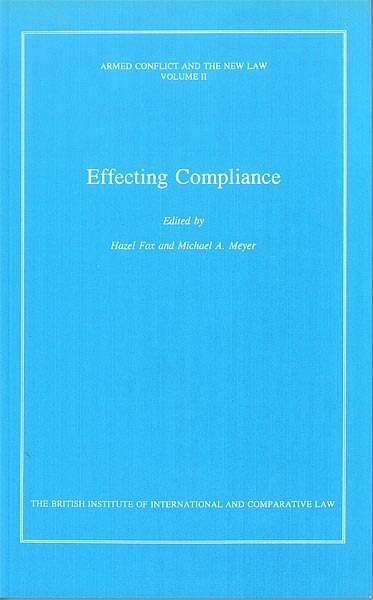 II (Effecting Compliance"